Being a first generation American, Thanksgiving is not the most traditional but definitely the most easily adoptable Western/American holiday. 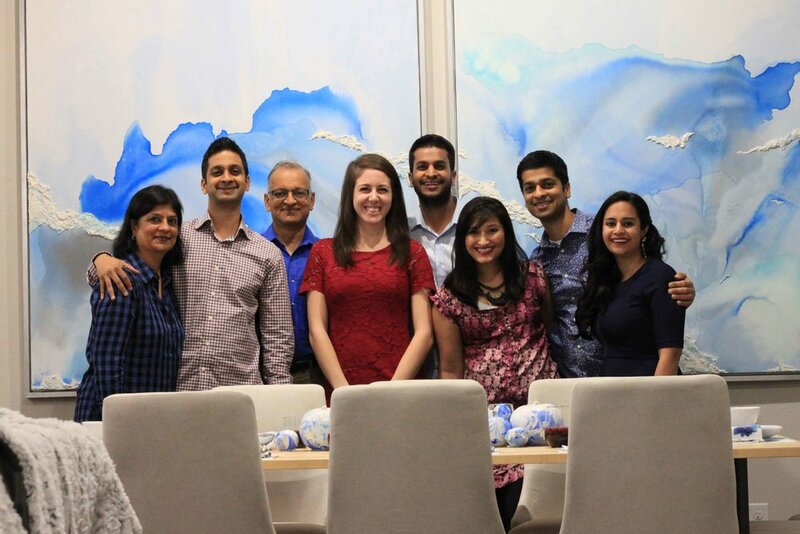 Due to the likely overlap by lunar calendars, Thanksgiving was usually masked by the tremendous amount of celebration surrounding Navratri & Diwali, but on occasion - our family would celebrate Thanksgiving. Its pretty easy as an Immigrant family to be thankful for the opportunities and happiness each year brings. That being said, this year was the first family Thanksgiving that the HUBS and I hosted. Since traditional menus are not that filling for vegetarians, or that flavorful compared to ethnic cuisines, we decided to deconstruct and create dishes that capture the essence of Thanksgiving without being trite. We also wanted to be fancy 😂 and serve each dish as a separate course in a plated fashion. I just have always wanted to recreate the experience of dining out at farm-to-table restaurants in my own home and what better occasion than a holiday? 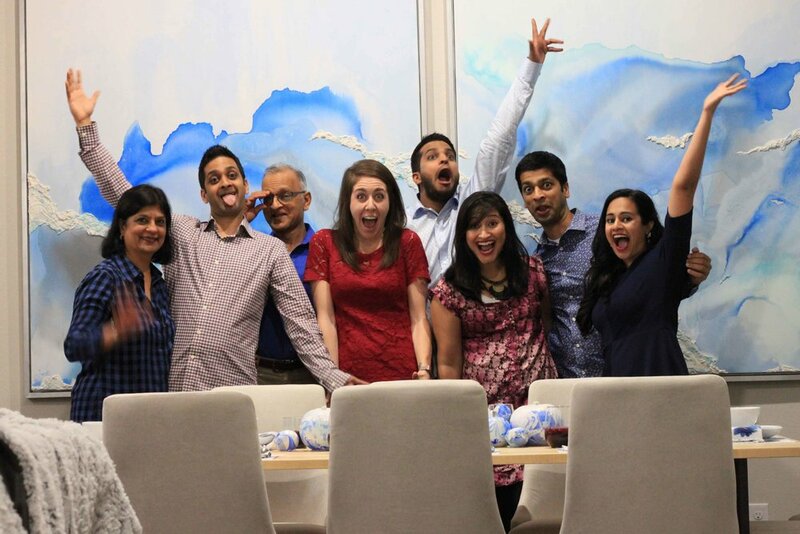 Keep reading to find out more about how we prepared for the HUBS' entire family to come visit, decorated our thanksgiving table, and created new classic dishes that were a tremendous hit! creamy roasted fennel dip served here with a baked baguette. In the past I have tried to make vegetable chips myself without really any success. The chips were always to thick to bake all the way through - and there is nothing more annoying than soggy chips. That being said, I really wanted to recreate a dish I had tried at this great little restaurant in Nashville called 5th & Taylor (if you haven't been you should go!). They make some seriously good eats including a creamy fennel appetizer dip that is incredible addictive. Instead of serving the dip with store bought root chips, I tried my hand one last time at making baked chips at home. The HUBS, his mom, his dad, and I used this slicer to cut carrots, parsnips, apples and sweet potatoes into 1.5mm thick pieces - the thinner the piece, the better it will bake. The slices were then tossed in olive oil with a pinch of salt and sugar. You can find the full recipe for this dip here: http://www.charismashah.com/cache1/2017/11/20/creamy-roasted-fennel-dip. baked sweet potato, carrot, parsnip, and apple chips served with creamy roasted fennel dip. For the second course the HUBS and I wanted to serve a Thanksgiving spin on one of our favorite recipes. 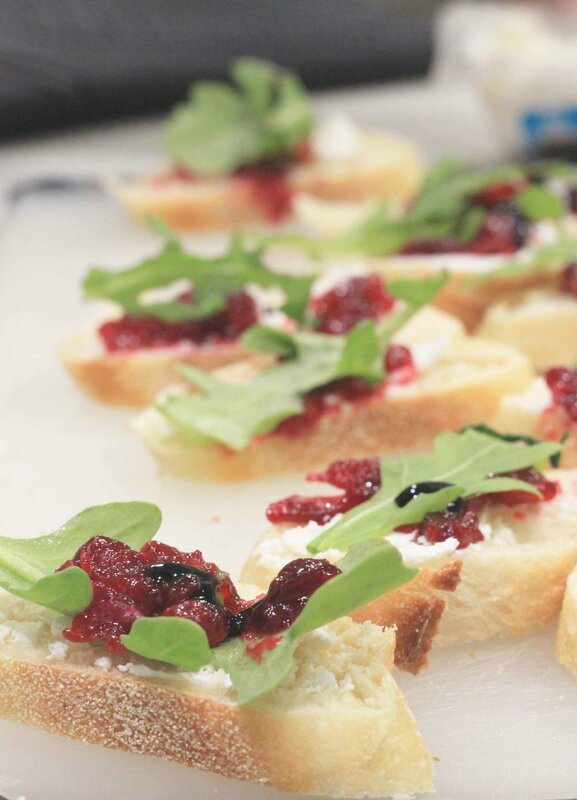 We bought some wonderful mini french baguettes from our local market, and topped them with goat cheese, fresh arugula and cranberry compote. We used this exact recipe, however substituted the cherries with 1 1/2 cups fresh cranberries, halved. homemade garlic & herb mashed potatoes garnished with chives. Since the portions of each course were becoming larger and larger, we started to slow down a little - taking and giving longer breaks between each course. For our next dish we decided to serve our absolute FAVORITE macaroni and cheese recipe ever. Really this mac n cheese can not be topped. I'll spare you from my excessive & obsessive love for this dish. Since mac n cheese is a Thanksgiving staple, we just HAD to make this rendition. To see the full recipe click here: http://www.charismashah.com/cache1/2017/3/16/flatiron-mac-cheese. 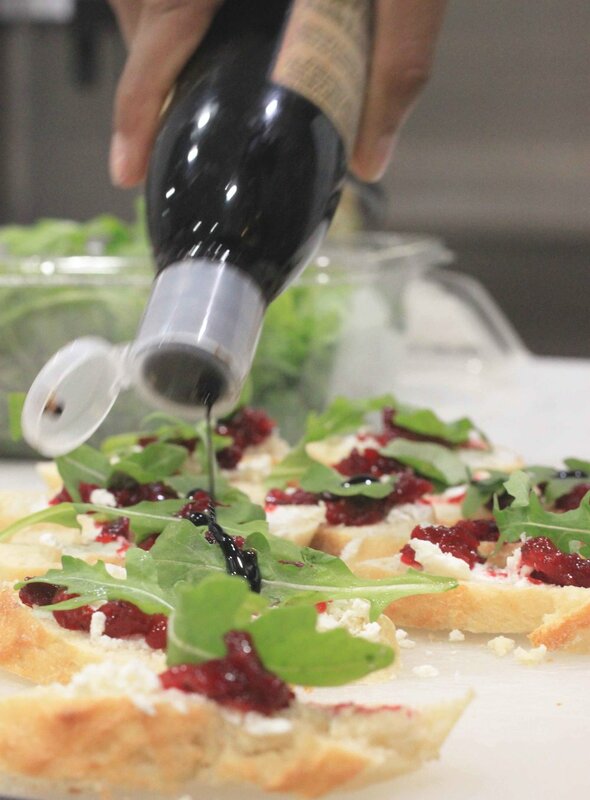 When making this dish we suggest using radiatore or toscani pasta to really sop up the sauce. At this point most of our family was pretty stuffed. Actually I was completely stuffed (that macaroni is very filling and rich)! I was so full I didnt even get to try this last dish. In lieu of turkey, I needed something really filling. The last thing my menu was missing was dressing, so I decided to make a vegetarian truffled quinoa dressing served on marinated portobello mushrooms with an herbed béchamel sauce. This was the dish I was most worried about since A) I hadn't even tried it and B) was completely made up haha. It ended up being a huge hit! So much that the little nephew loved it too 😀. To view this recipe click here: http://www.charismashah.com/cache1/2017/11/20/vegetarian-thanksgiving-entree-alternative. dipped in cinnamon sugary goodness. The last course was simply mulled wine. The HUBS and I took two bottles of Rioja, added some chopped granny smith and red delicious apples, oranges, 6 cloves, 1 cinnamon stick, pinch of nutmeg and let this slow cook on the stove over low heat for 4 hours. Immediately before serving, we topped off each glass of mulled wine with a splash of sugar-free orange soda. Delicious and not too sweet! We had such a wonderful time celebrating our first official Thanksgiving with our family. We are so thankful that it worked out for everyone to come together from all over the country for this holiday. It could not have been more perfect! P.S. I will be posting a tutorial tomorrow on how to we created our tablescape!